Thieves in the Night: With Comet Grijalva predicted to wipe out life on Earth, Jason Pendrick fled to his uncle-in-law’s farm. When the apocalypse doesn’t happen, he has an opportunity to help rebuild society, but will the past drag him down? Washed Clean: Seimunda lives in a hovel, eking out a living bartering herbal remedies to villagers. But an accusation of witchcraft threatens to rob her of even that. Some Secrets: Always appearing when least expected, a mysterious man orders whichever sandwich Jo has been eyeing up. Do they just have similar tastes or is it something more inexplicable? Either way, there is definitely a connection. Blossom: When Mari Austan’s husband, Jerek, joins the army she is left to run their drought-stricken farm alone. As both her crop dies and the letters home falter, she relies on cold fury to get through the days. But will she break before the weather does? An Unquiet Calm: When Frances Withrick is found holding the revolver that killed her husband, Inspector Stevens expects an all too human case of anger and regret. But a second killing and evidence the revolver was loaded with very unusual cartridge, force Stevens to consider a different theory: that the whispers of an inhuman force in the hills are true. An Unquiet Calm is a dark look into the struggles of people in impossible situations. It will make you think, give you pause and maybe even provoke a shiver of disquiet. …Dark, moody and often brilliant, this book fills you with a mix of creeping dread and a sense of wonder at the vivid worlds that Dave creates. 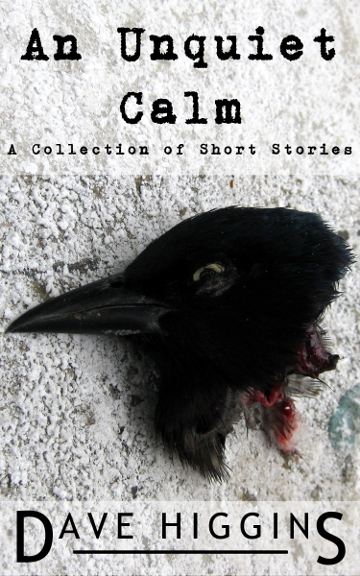 An Unquiet Calm is a dark collection of short stories that will have you checking over your shoulder as you read. Filled with worlds you’d never want to live in, Dave Higgins weaves a cocoon of dread around you and won’t let you out. —Simon Cantan, author of the Bytarend Series. There’s a running theme of the otherworldly, ranging from the very grounded and possibly-coincidental in ‘Some Secrets’ to the dangerously potent in ‘An Unquiet Calm’ itself. —Neil Murton, author of Magpie Tales.